Wow, it’s been a long time! I guess I got swallowed up in the new baby, then active toddler hole. But one of my new year’s resolutions this year is to get back to knitting (and designing) and posting more regularly on this poor, neglected blog. 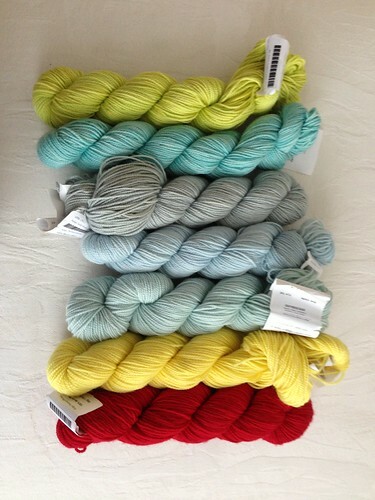 I went to Purl Soho this Sunday to pick out some Koigu for a new granny square blanket. I had made one for Olivia before she was born with colors very similar to the shop’s sample — pinks, reds, oranges, browns. This time, I decided to go with some more masculine colors for the little boy we’re expecting in May. I wanted their blankets to be similar, but different. And I knew I wanted Koigu — I just love their nearly solid colors and the tight twist in the yarn. And with the leftovers, I’ll have enough to make several newborn socks. I will be back in a few days to talk about upcoming plans for designs and my experience teaching at VK Live this past January. Welcome back to the world of blogging. I always loved your delicate and feminine designs so I’m excited to see what you are going to come up with mext! Congrats on the boy to come! I’m actually due with a boy in June — so fun! Glad to see you back here. I’ve been considering it too but there’s just so much going on. Welcome back and best wishes! Glad you’re back on the blog. I love the colors you picked out for the blanket! So nice to have you back! Missed you! Congratulations on the upcoming baby! Congratulations! Enjoy knitting for your little boy. Those colors are very nice together! Hello I’m new to your blog I made my way here through the Quince & Co blog. Love the colors you selected. I’m also a new knitter so I’m excited to see the finished blanket.